On 14 March 1892 a new ship was launched at the W. Dobson & Company shipyard at Newcastle, England. The vessel was a steel cargo ship built for W. Milburn & Company (the Anglo-Australasian Steam Navigational Company Limited, Milburn Line) of London. The ship was named SS Ashington. The new vessel was 206' 7" long with a width of 30' 1" and a depth of 14'1" (c 62 x 9 x 4.25 metres) and a gross tonnage of 880 tons (net 531 tons). She was powered by a 98 nhp triple expansion steam engine constructed by John Dickinson & Sons of Sunderland, England. The steam came from one coal fired Yarrow boiler 3-drum water tube boiler and drove a single screw. She carried 120 tons of coal for her engine. The engine's cylinders' diameters were HP 17", MP 28" and LP 46" with a stroke of 33". This gave her a maximum speed of 9 knots. She appears to have been a collier, at least for most of her life. She had a carrying capacity of 1300 tons in 58400 cubic feet of holds. The ship was completed in May 1892. I assume that the Ashington traded along the English and perhaps Scottish coasts, but I have no evidence of this at the moment. One reference says that the owning company during this time was Ashington Coal Company, Newcastle, England. This appears to have been a subsidiary of W. Milburn & Company. 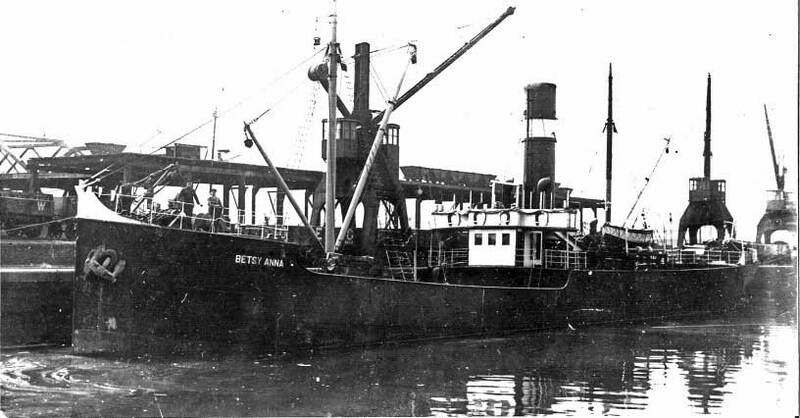 In 1905 she was sold to W. H. Berghuys of Amsterdam, Holland and renamed SS Betsy Anna. They set up a company that appears to have been called "Maatschappij tot exploitatie van de Betsy Anna" (Company for the exploitation of the Betsy Anna). From then the ship was used mainly for transporting coal. The coal was from various European countries, with the deliveries going all the way through the Mediterranean and Baltic waters as well as all along the Atlantic Coast. 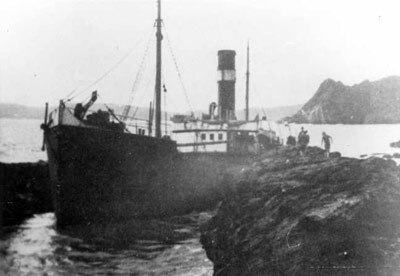 On 17 August 1926 the Betsy Anna was on a voyage from Fleetwood to Rotterdam in ballast when during a very heavy fog she ran aground on Prawle Point, Devon, England. The ship was wedged straight up between the island and the mainland. As the weather was very calm, she did not break up. 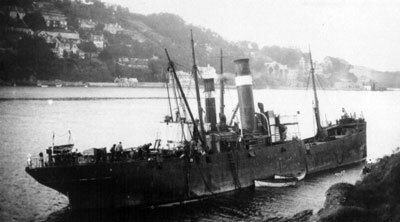 On 3 October 1926 she was towed off by the tug Trustee and beached near Salcombe for repairs. On 12 October 1926 she was being towed towards Cowes on the Isle of Wight when her tow parted off Portland Bill. She sank off The Needles, which is to the east of Swanage. Is this the same time as the photo at left? Today the wreck of the SS Betsy Anna (ex SS Ashington) sits at about 24 metres just under 10 kilometres east north east of Swanage. A GPS of N50° 36.979' W1° 49.964' (using WGS84) will put you near the shotline. The shotline on the Betsy Anna is located near the boilers. This site is affected by tidal currents so you can only dive it at high or low slack water. We dived it at low, so the visibility was not great (four metres). When it is time to dive, you drop off your boat near the shotline buoy and descend. Unfortunately when I did this, a lighter section of line attached to the main shot caught on one of my BCD weight pockets and ripped it out. It then plummeted to the bottom. 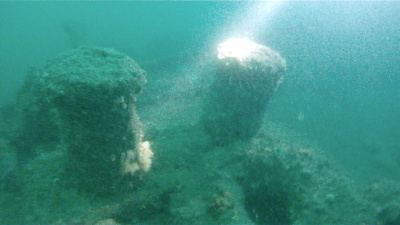 I decided that I would be able to find it as I was already more than five metres underwater and the bottom is only 24 metres. 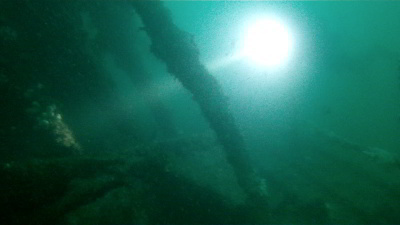 I dropped down till I could see the wreck and then attached my reel to a part of the wreck. I motioned to Kelly what had happened and then we swam out straight under the shotline (which was off at an angle). Within 15 metres I spotted the pocket and put it back in. 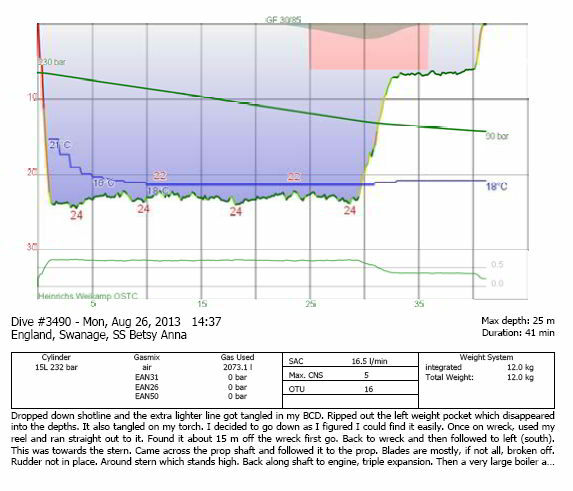 When we returned to the wreck we could see that the wreck is tilted over at 45° to starboard. We turned to our left and soon spotted the prop shaft where the hull bottom had fallen away. There was also a large winch here. We followed the shaft to the stern. The prop is still there but it is missing most or all of its blades. This could have happened when the ship sank and the still turning prop hits the bottom (I have seen this on other wrecks). The stern section is relatively intact and stands quite high. You can easily enter inside this section without any problems. From here we followed the wreck back towards the bow. As we were again following the prop shaft, the first major thing we saw was the triple expansion steam engine. This has fallen over to the port (rather than starboard). In front of this is a huge boiler which is still sitting upright. There is then another smaller one, also upright. In my notes about the dive I stated that the ship had two funnels. I presume that I wrote this because I saw two. However, the main photo at the top of this page as well as the left hand one down further clearly show only one funnel. However, the right hand photo seems to show a large and a small funnel. This makes me think that perhaps the Betsy Anna ran aground twice and the photos above are of separate strandings (see the rocks on left of left hand photo, not there in the right hand photo). Anyway, from here we went forward again. There are some bollards and then at the bow a large winch. The bow is also very high and you can enter it as well. From here we went back to the boilers, engine and stern. As the depth is only 23 metres on average, you can spend a lot of time exploring. From the stern we shot an SMB and ascended. 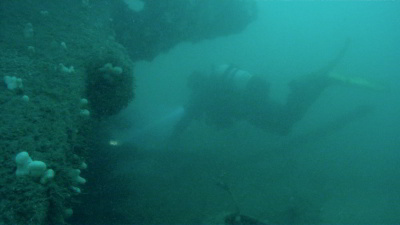 The SS Betsy Anna is a very nice wreck, quite large but able to be explored in one dive. I dived it out of Swanage and the water temperature was just over 18°C (in August) and the visibility about four metres (the other divers expressed glee at this visibility!). Kelly and I did a bottom time of almost 30 minutes on air which required four minutes of decompression at six metres (we went into deco at about 20 minutes). 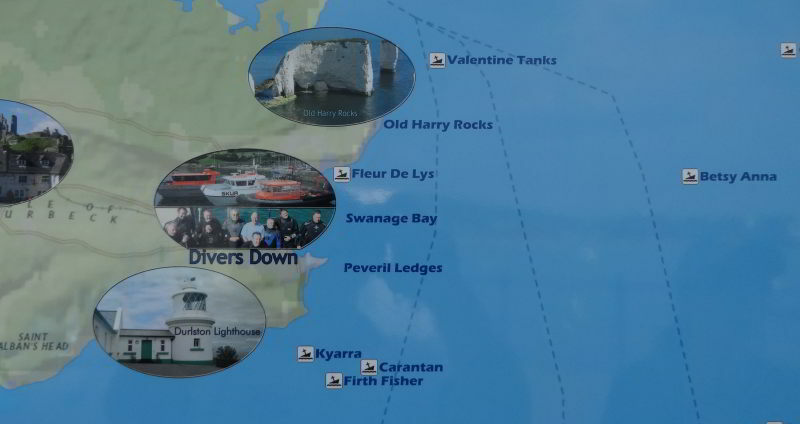 The site is affected by tidal currents so you can only dive it safely at slack water. Highly recommended.